2016 will see a slew of superhero films released, with Marvel Studios, Warner Brothers and Twentieth Century Fox all bringing some of the most iconic comics characters to the big screen. Captain America: Civil War and Batman v Superman: Dawn of Justice will both explore themes of superhero accountability and their impact on the world. On the other hand, X-Men: Apocalypse will explore mutant history, kicking off the "true birth of the X-Men" and bringing the trilogy that started with X-Men: First Class to a close. Footage from Apocalypse was shown earlier this year at San Diego Comic-Con, fans have been left waiting for the official trailer since. Finally, after rumors the trailer would be attached to The Martian earlier this year, Fox has released the first trailer to the public. The trailer offered new insights to the plot of the film, as well as a shot of the newly bald Professor X (James McAvoy). 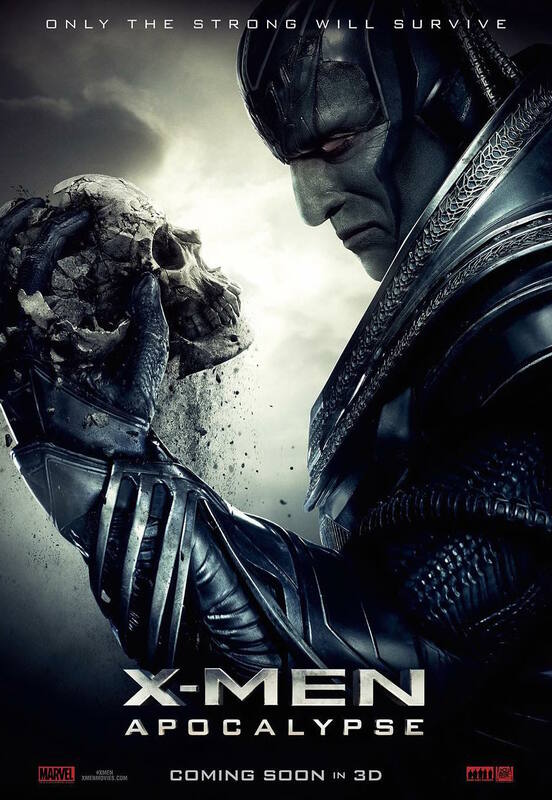 Alongside the first trailer, director Bryan Singer revealed a new poster (below) for the upcoming X-Men: Apocalypse. The poster features a profile shot of the film's eponymous antagonist (played by Oscar Isaac) as well as the film's tagline: "Only the Strong Will Survive." Though the titular villain does have brief appearances in the first trailer, most of the shots conceal his face. This Apocalypse poster provides a better look at the character, showcasing small details that reference his original appearance - such as the lined cheekbones. The colors seem to be more in line with the character's comic book appearance as well, though whether that will translate to the final cut of the film is unknown. The Apocalypse movie tagline is a direct reference to the history of the character, taught in ancient Egypt that strength is the only way to survive the harsh desert. The mantra became the driving motivation behind Apocalypse's future actions, seeing him cultivating his powers while testing the strength of his enemies. The character would go into long periods of stasis to increase his powers, occasionally resurfacing throughout history. One period in which Apocalypse resurfaced was the middle of the nineteenth century, approximately the same time that Charles Darwin published his theories on evolution. It was during this time that Apocalypse met Nathaniel Essex, a scientist who would go on to be the villainous Mister Sinister. The two characters formed an alliance, with Apocalypse granting Essex new power. There's no word yet on whether Sinister be referenced in this film, but the connection could allow him to serve as the villain in the upcoming 2018 X-Men film. With Bryan Cranston already voicing his desire to play the character, it's an enticing possibility for the future of the franchise.